ApoE4 and the Insulin Receptor — It's a Trap! 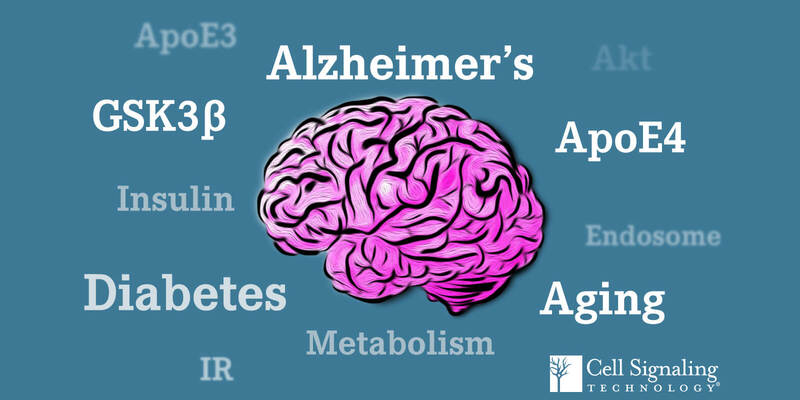 You might be surprised to learn that diabetes, a metabolic disease, may be linked to the neurodegenerative condition Alzheimer’s disease (AD). Diabetes is driven by altered insulin signaling from either insufficient insulin production (Type 1) or altered insulin receptor (IR) signaling (Type 2). In a seemingly unrelated disease, the human e4 allele of APOE is the strongest genetic risk factor for AD. APOE encodes human apolipoprotein E (ApoE), which is a lipid carrier vital for cholesterol homeostasis. Natural allele variations result in expression of 3 ApoE isoforms, E2, E3, and E4. Differences in one or two amino acids in ApoE significantly increase risk for AD, with APOE4 allele carriers at highest risk compared to the more common APOE3 allele. As it turns out, APOE4 carriers exhibit altered brain insulin signaling and glucose metabolism, suggesting a mechanistic clue as to how diabetes and AD may be linked. In a remarkable paper reported in Neuron recently, Zhao et al., sought to investigate the potential mechanistic link between the AD risk gene APOE4 and altered metabolism. The authors utilized an APOE mouse model in which the murine Apoe gene was replaced with human APOE3 or APOE4. Examining aged brain lysates from each genotype, the authors observed age-dependent alterations in basal insulin signaling. That is, APOE4 aged mice exhibited decreases in IR signaling compared to APOE3 when measuring the phosphorylation states of downstream IR substrates, Akt (Ser473) and GSK3B (Ser9). Based on these results, the authors hypothesized that ApoE may directly alter insulin signaling in an isoform-specific manner. Consistent with their hypothesis, the authors observed ApoE isoform-dependent alterations in insulin-dependent cellular signaling: APOE4 mice exhibited reduced insulin-stimulated phopsho-Akt compared to APOE3 mice. Similar results were also obtained using primary neurons derived from Apoe -/- mice when recombinant ApoE3 or ApoE4 was directly applied to cultures with or without insulin, suggesting that ApoE protein may directly modulate insulin signaling. How might this be the case? The authors examined the possibility that ApoE might directly bind to IR. Using recombinant protein, the authors observed direct ApoE binding to IR using ELISA assays. Remarkably, ApoE4 exhibited enhanced IR binding compared to ApoE3. How can ApoE4-dependent reduction in downstream IR signaling and enhanced ApoE4/IR interaction be mechanistically reconciled? IR cell surface availability is regulated, in part, by circulating levels of insulin. Interestingly, ApoE4 treatment results in the overall reduction of cell surface IR; moreover, ApoE4 acts synergistically with insulin to drive greater reduction of cell surface IR than co-treatment of ApoE3. Importantly, the authors also observed ApoE4-specific enrichment with IR in early endosomes, at least in cultured cells, suggesting a mechanism by which ApoE-specific isoforms might trap IR’s in the cellular trafficking machinery to alter IR signaling. Together, this paper describes and proposes a novel mechanism by which specific AD-linked ApoE isoforms might impair insulin signaling in the brain, contributing to disease progression. However, several questions remain. For example, the authors find that ApoE4-dependent alterations in IR signaling and its effect on IR stability accelerate with age. Are these alterations correlated in time with altered behavior or cellular alterations (e.g., synaptic dysfunction) observed in AD mouse models? A shared timeline might suggest a common pathway to disease. Moreover, are there mechanistic differences between “classic” (i.e., acute) insulin-mediated signaling endosomes that activate IR pathways, versus chronic ApoE/insulin-mediated IR endosomal entrapment that reduces IR signaling pathways? Finally, one wonders if some brain cells might be more sensitive to altered insulin receptor signaling than others. Certainly, more research into the convergence of these seemingly disparate pathways will elucidate a way forward to understanding the mechanistic trap that is AD.